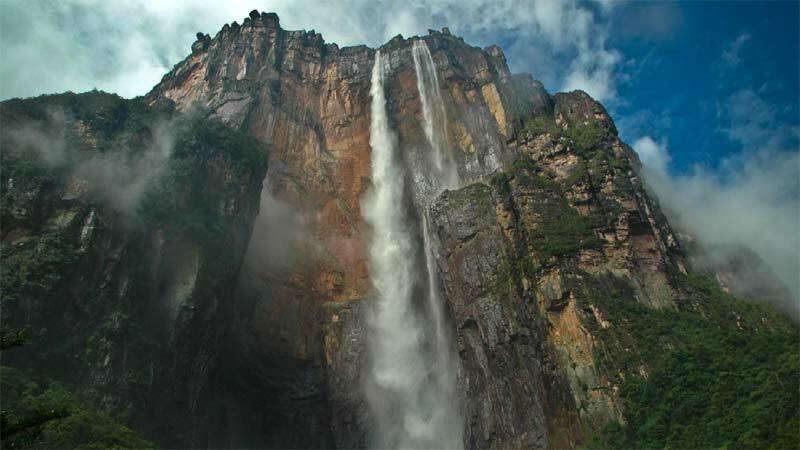 Angel Falls, the world’s highest waterfall, is so high that much of the water evaporates before it can reach the ground. Angel Falls waterfall is located in Venezuela. It is the world’s highest waterfall, with an amazing height of 979 m (3,212 ft) and a plunge of 807 m (2,648 ft). Because of its great height much of the water evaporates before it can reach the ground. Most of the water vapor is carried to surrounding areas, thus lushing plantlife even in the most arid seasons. The waterfall drops over the edge of the Auyantepui mountain in the Canaima National Park (Spanish: Parque Nacional Canaima), a UNESCO World Heritage site in the Gran Sabana region of Bolívar State. The base of the falls feeds into the Kerep River (alternatively known as the Río Gauya), which flows into the Churun River, a tributary of the Carrao River. Because of its isolated location, a trip to the waterfall is a complicated affair even today, yet Angel Falls remains one of Venezuela’s top tourist attractions.